I didn’t have a ton of time this week, and I spent most of it focused on Magic. This edition of cube has treated me very well. 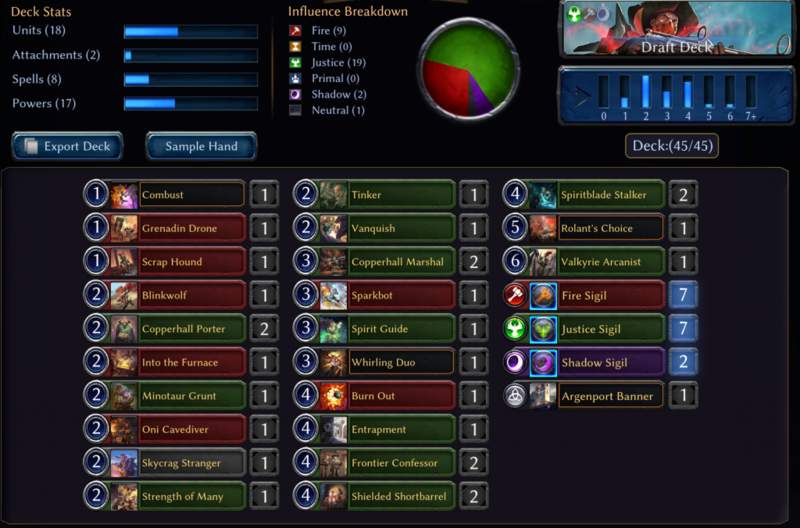 Still, I drafted a couple of decks, including one just now so that I could fill out my weekly post. I started the week off on the right dino-sized foot. I snapped up Frenzied Omnivore and Sandbinder Sentinel with my first two picks, but the rest of pack 1 was very mediocre. I ideally wanted to be Praxis with those first two picks, since Frenzied Omnivore pairs well with actual removal (as opposed to Stuns), and Sandbinder Sentinel pairs well with explorers and other sentinels that are more plentiful in Praxis. I took an Into the Furnace, along with a few mediocre fire cards, before rounding out the pack with a late Freewing Glider and two copies of Bellowing Thunderfoot, which is a card I have yet to play despite my numerous drafts in this format. Pack 2 showed me where fate wanted me to be when I opened Evelina, Valley Searcher. I had no other explorers yet (and would only get one), but she alone is a fantastic 2-drop for the Dinosaur deck. I got some decent Primal cards out of pack 2, but Time did not seem all that open. 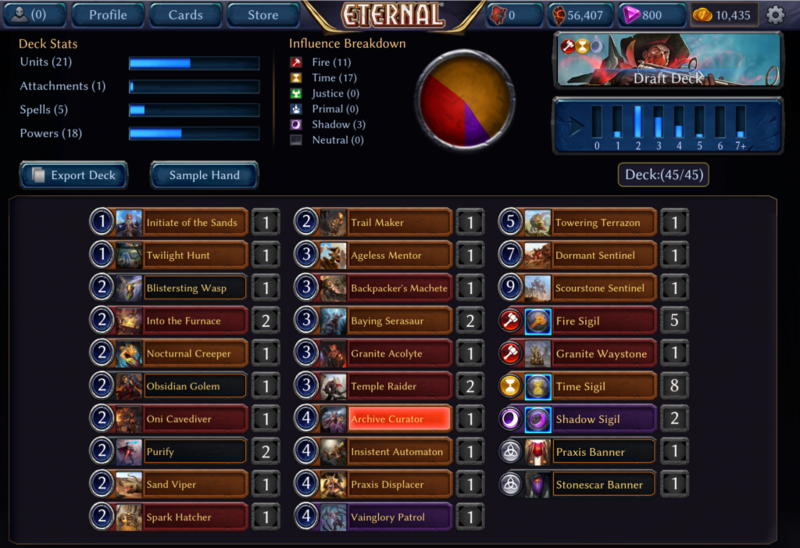 Looking at my final list, I did not play any time cards out of packs 2 or 3 (which come from the same player) other than the Evelina I opened and an early-pick Xenan Guardian. It didn’t matter, as pack 4 contained lots of dinos for me to snap up, along with Scaletender. I wound up having to play a couple of top-end stinkers in Timeworn Sentinel and Scourstone Sentinel. The payoffs for those just weren’t there in this deck, but the sheer amount of beef on the ground, combined with a bit of flying pressure, made up for having unplayable cards stuck in my hand. I crushed everyone I faced, losing my only game to an absurd flood. Bellowing Thunderfoot was incredible, especially Bonding it out on turn 6 off a Fishing Dinoch. Nocturnal Kyrex was as bad as I thought it would be, but sometimes he helped make a turn-5 Dinoch into a 6/6, so I can forgive the cute little monster. This is another one of those decks where I feel that it was wide open in both directions, but the packs sometimes just aren’t deep enough to fill out a deck, even when you find the right lane. I got late Into the Furnaces and Spark Hatcher in packs 1 and 4, and late Purifies and Praxis Displacer in packs 2 and 3. Yet, somehow, despite clearly being in the right seat to draft Praxis, I wound up thin on playables and had to splash. I had a good deal of fixing, which made it less painful, but I don’t really want to be splashing things like Obsidian Golem and Vainglory Patrol. These are good cards, but they can’t really dig you out of bad situations, which is where I want my splash cards to be. I also had to play a pair of Temple Raiders. Don’t try this at home. They were real bad, especially with only 3 sentinels, one of which I’m pretty sure was legally uncastable in this deck. 3-3 is about where I expected to wind up. The deck definitely had the raw power to do better than that, if it fired on all cylinders, but it was just as likely to lose to itself. I tilted off so hard at losing with this one that I forgot to take a screenshot of it. 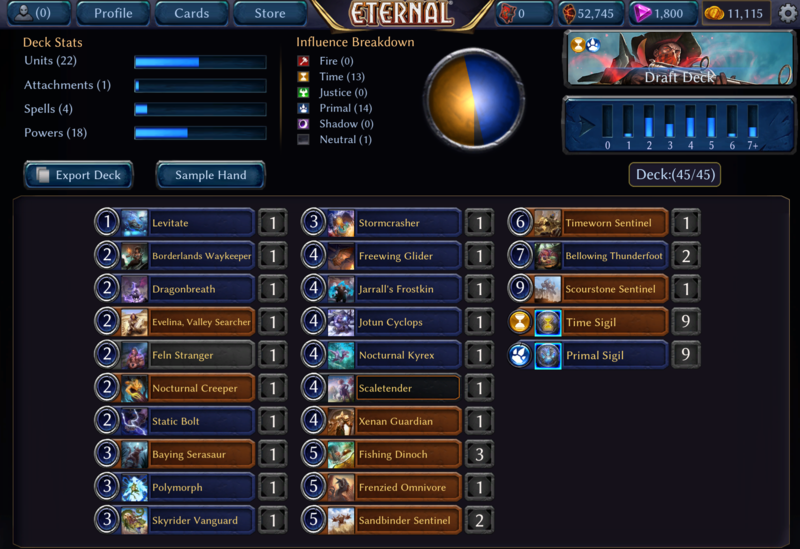 I drafted a very good Argenport deck with Rooftop Vigilante, Spiritblade Stalkers, and Valkyrie Arcanists and proceeded to lose 3 of 4 to nothing especially powerful. Sometimes the cards just don’t line up for you. I focused on Magic for a couple days, then tried to get back on track with this one. Justice was clearly open, and an early Whirling Duo pushed me toward Rakano, but after Pack 1 I was mostly Justice. Rolant’s Choice midway through pack 2 made me waver on that, which punished me a little when I took Argenport Banner over a decent Fire card. I wound up barely scraping by on playables, but the deck had some real nice curve-out potential. Basically, I won every game where I played Whirling Duo on 3 and lost every game where I didn’t. Frontier Confessors never really lined up for me to get good value, and I lost my last round after drawing 15 of my 17 power in my top 30 cards. I feel like this deck deserved maybe one more win, but I hit upgrades on two of the gold chests so I can’t complain too much. Besides Rolant’s Choice, which is one of the most powerful uncommons in the format, Combust was definitely worth the splash in this deck, as I always had some random idiot that was getting bricked by something on my opponent’s side. I would gladly have traded the Entrapment for another Into the Furnace or other proactive removal/pump spell. It was okay, but an aggro deck like this isn’t really looking to play cards like Entrapment, since if you’re getting attacked, things probably aren’t going too well. You still get to get ’em if they try and stack weapons on something, but it’s certainly less amazing than it would be in a slower deck. It’s hard to complain about a positive week, but I didn’t feel too great about it. Outside of that great Elysian deck, I was 8-9 on the week, which is definitely not where I want to be. I’m currently hanging around low diamond. I’m still confident in reaching master this month, but I’d like to have made a little more progress this first full week. Card of the Week goes to Bellowing Thunderfoot. This big guy really impressed me. I’ve avoided drafting non-justice Ally decks, since I feel the density of low-cost enablers just isn’t there, but when you get there, you really get there. Jarrall’s Frostkin is already an insane tempo play, and when he’s a 5/5 with overwhelm that can chain out another one in the same turn, you have a recipe for killing your opponent out of nowhere.